Knight Elementary School has this year implemented a Peer Mediator program, allowing certain sixth-graders to help younger students solve problems. The school has long had an enterprise program, in which older students hold "jobs" at the school, such as cafeteria helper, tutor or peer mentor. This year, however, the peer mentor schedule wasn't working out. So staff members saw it as an opportunity to finally implement some school goals through creating the new program. Principal Christine Taylor, Intervention Specialist Louise Thomas, Counselor Amie Mykisen and several sixth-grade peer mediators presented the program to district staff at the January school board meeting. Mykisen described how the team was careful to develop a problem-solving standard for peer mediators to follow. 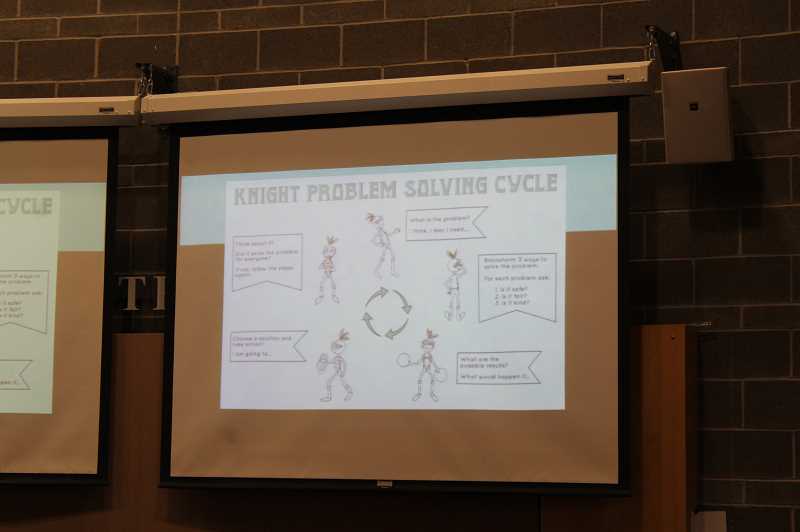 They ended up with the Knight Problem-Solving Cycle—a cycle, so that students can continue the process if the results don't turn out as hoped. The cycle includes five steps: identifying the problem; brainstorming ways to solve it that are safe, fair and kind; predicting results if the plan were implemented; choosing a solution and taking action; and finally, considering how well the solution worked out for all involved. Of course, if it didn't turn out well, then it's time to repeat. Sixth-grade students applied to be peer mediators. Those students were then trained on the problem-solving cycle and even participated in several practice sessions. The peer mediators will be working with students in kindergarten through third grade. "We felt like it's been able to give our peer mediators a chance to build their own self-esteem and leadership, and it's allowed them to be great role models for younger kids," Thomas said. "It's just a real benefit to the whole school to have extra people who are well-trained in the process," she added. The selected peer mediators are eager to begin helping in real-life situations. 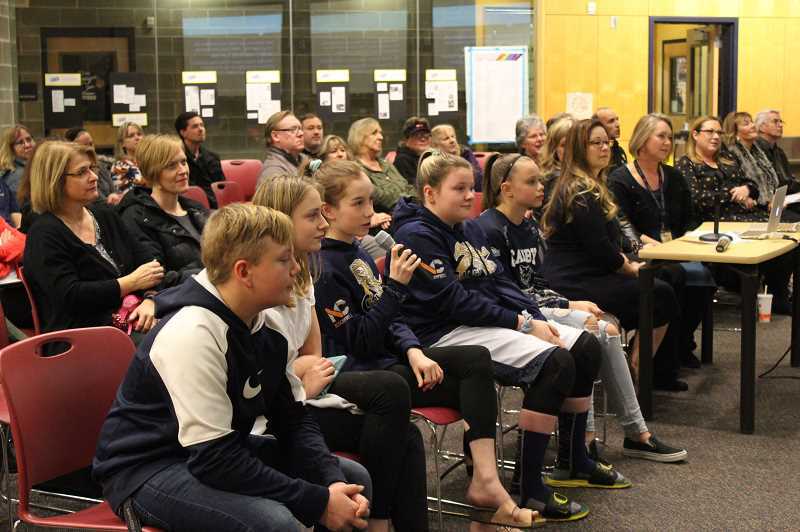 "I want to help out at school, and I think that sometimes students might listen to another student better than an adult," one sixth-grade peer mediator said at the meeting. Another said, "I want to be a peer mediator because I like helping people with their problems. Some people have several friend conflicts, and I am hoping I can help resolve them." Not only have the peer mediators been trained in best problem-solving practices, but the staff has worked to spread the concept to the whole school. "We began implementing this by introducing it in an all-school assembly," Mykisen said. "We had a few of our fabulous peer mediators, who are here, who role modeled a problem. We chose sort of a fun, little problem of a ball game that hadn't gone well. We had the problem-solving cycle projected on the board, and so we watched the problem happen as a school, and then we watched the students step through each step of the process to see how it really looks to apply." From there, Mykisen taught lessons in every classroom, and staff spread bilingual posters throughout the school to reinforce the schoolwide approach. Now that staff members have gotten the program off the ground, they're hopeful that in the future they'll be able to get it going earlier in the school year.